OAKLAND, Calif. -- The Oakland A's first-ever LGBT Pride Night is drawing some controversy and the girlfriend of one of the players is offering to step in. Some season ticket holders want to sell their tickets for the June 17 game. 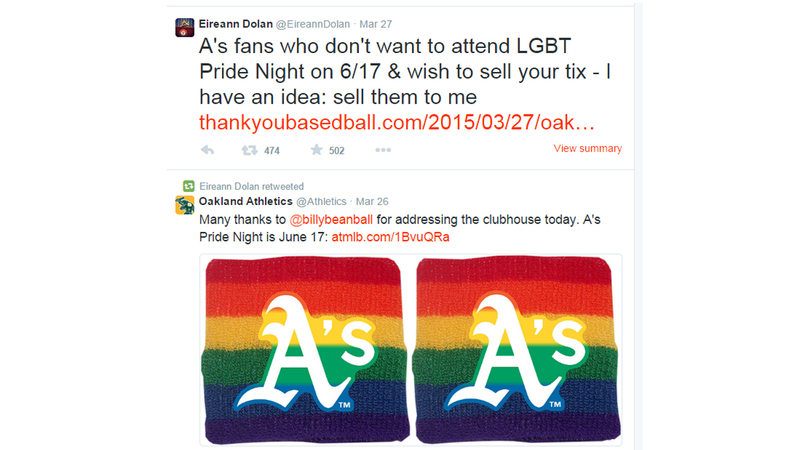 Eireann Dolan who is the girlfriend of A's pitcher Sean Doolittle, says it made her sad to hear, so she's offering to buy tickets from anyone, and everyone, who wants to sell them and donate them to an LGBT youth group. Dolan was raised by two moms who are die-hard fans. She says she'll buy as many tickets as she can.